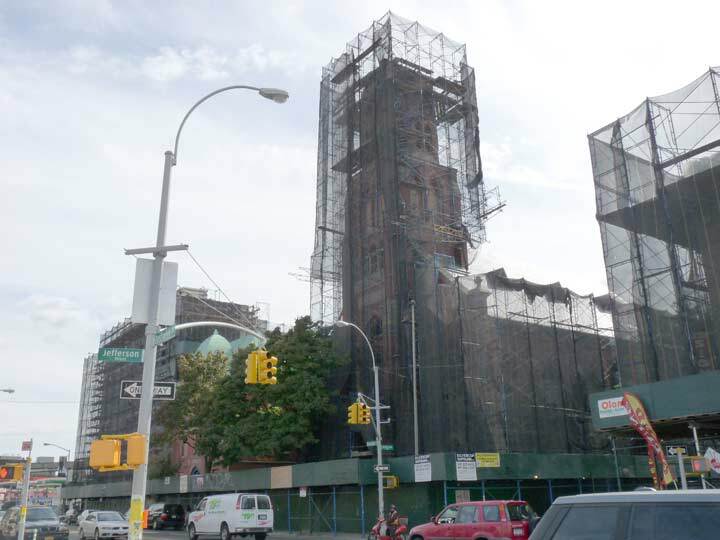 The “City of Churches” has lost more of its more distinctive steeples as the former St. Mark’s Evangelical Lutheran Church at Bushwick Avenue and Jefferson Street, dedicated in 1892, is covered in scaffolding, its school next door hollowed out, and its steeple already gone as the building is being converted to a luxury residential. Perahps the inscriptions in German on the building exterior will be preserved when the netting comes off. More on the building and its history at Bushwiki. I’m very familiar with this location. That’s because my daughter attended grade school at St. Marks Lutheran School. Not only are there German inscriptions outside, but they’re in abundance inside. My grandmother and her family went here. I have her confirmation books from 1899 that are all in German and inscribed by Pastor Emil Frye. They came from Germany in 1881. Ironically, they lost their youngest in WW1, Michael Stieflein, fighting for US. His name is on memorial on Myrtle Avenue in Ridgewood. My grandfather was John Stieflein from Ridgewood Queens. He married Sophie Kling and had my father John. Are they related in any way, maybe they were siblings. Please e-mail any info about Michael’s relatives. Just revisited this site after looking at article of one hundredth anniversary of WW1. Michael died in October 1918. He is buried in France. His parents were Regina Grimmer Stiefelein and Johann Stiefelein. They came from Bavaria, but I do not know what town. Somehow they seemed to change their name to Stieflein. I do not know if this was a clerical error by immigration. I have noticed your grandfather’s name on Ancestry. Perhaps they were cousins. Their daughter Anna was a year old when they came. The rest were born here. Emma, Elizabeth, John and Michael. Johann died in1909 and Regina in 1937. They are buried in Lutheran Cemetary on Metropolitan Avenue in Middle Village. There must be some association if George was a child when he died. Cemetery. Annie died in the 60’s. If this is so, small world, isn’t it. My great Aunt Anna Stieflein, daughter of Regina and Johann was married to John (Hannas) Krimmel. They had a son George who died as a child. His brother John I believe died during WW11 due to disease contracted during his service. Anna and her husband along with their adult son were also buried in Lutheran Cemetary. They and I may be related to your family somehow. I do Ancestry.. this is my second reply. I’m not sure it went through. I was a member of St. Mark’s until 1967, when I went off to college in Indiana. Our youth group was very active and the church, led by the late Pastor Erwin Prange, had a tremendous community outreach program. We had two English, one German, and one Spanish service every Sunday. In September 2007, our youth group alumni gathered for a reunion. We had approximately 50 attend, including spouses, from all around the country. We gathered at St. Mark’s on Saturday morning to visit the church and Sunday School building. That evening we went to Plattdeutsche Park in Franklin Square, LI for dinner and polka dancing. Our annual church picnics were held there. On Sunday, we attended church services and our former Vicar, cousin of Pastor Prange and retired Lutheran minister, stepped up to conduct communion because the church only had a dozen members and no minister. We had fond memories with great youth friends from diverse backgrounds. In all of our years together, we never had a fight amongst us. What a great faith community. We still keep in touch thanks to Facebook. God bless them all and all the people the St Mark’s congregation touched over the 100+ years. Hi John. This is my third try for the reply to go through. and I believe was sent home to be buried. If your George is a child or fairly young, it may be we are related. I think Anna and John are also in Lutheran Cemetary. Annie died in the 60’s.